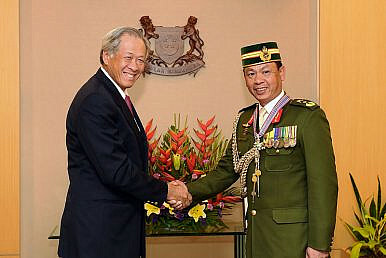 Singapore Defense Minister Ng Eng Hen congratulating the Commander of the Royal Brunei Land Forces (RBLF) on receiving a prestigious award. The two countries hold the third iteration of a joint training. Brunei and Singapore began a marine exercise this week, local media outlets reported Tuesday. According to The Brunei Times, two police coast guard boats from the Singapore Police Force, PH53 Blue Shark and PH55 Basking Shark, docked at Muara Port on Monday to kick off a sail training exercise to improve coastal patrol operations and crime prevention. The exercise is aimed at boosting the capabilities of both the Royal Brunei Police Force (RBPF) and the Singapore Police Coast Guard (SPCC). The two ships are 35 meters long and reportedly carried a crew of 42 personnel. The welcoming ceremony for the ships was attended by the acting deputy commissioner of the RBPF, Mohd Irwan bin Haji Hambai, as well as directors and commanding officers from the two police forces. According to The Brunei Times, the joint exercise would be held followed by a friendly sporting game between the police forces of the two sides. Singapore-Brunei relations have also been in the spotlight over the past week with the five-day visit of Prince Abdul Malik to Singapore, which ended August 19. During his visit, he met with several officials, including Prime Minister Lee Hsien Loong, Foreign Minister Vivian Balakrishnan, and Deputy Prime Minister and Coordinating Minister for National Security Teo Chee Hean. Topics discussed included security-related developments, youth exchanges, and education. He also visited the Police Operations Command Center and the Home Team Tactical Center (HTTC), where he witnessed a counterterrorism demonstration exercise and was briefed on Singapore’s security situation at the National Security Coordination Secretariat. Meanwhile, the Commander of the Royal Brunei Land Forces, BG Pengiran Dato Aminan, was also conferred a prestigious military award by Singapore during his visit to the city-state from August 15 to 17. As part of his visit, he met with several Singapore defense officials and visited a few facilities in the country as well. What Did the Brunei Sultan’s Singapore Visit Accomplish?Air Force Exercise Puts Brunei-Singapore Defense Ties into FocusSihanoukville: A Cambodian City Losing Its ‘Cambodian-ness’Is Vietnam Creeping Into a Succession Crisis?What Does Jokowi’s Win Mean for Indonesia’s Economy?